A contemporary home with a geometrical exterior design and totally relaxing interiors and outdoor spaces. Different styles, concept and design matters the most in building or even renovating our own houses. We tend to search for trendy or latest interior designs and landscape that will be more catchy and sustainable. Today we will explore the remarkable features of the house named Elizabeth Street built in Auckland, New Zealand. 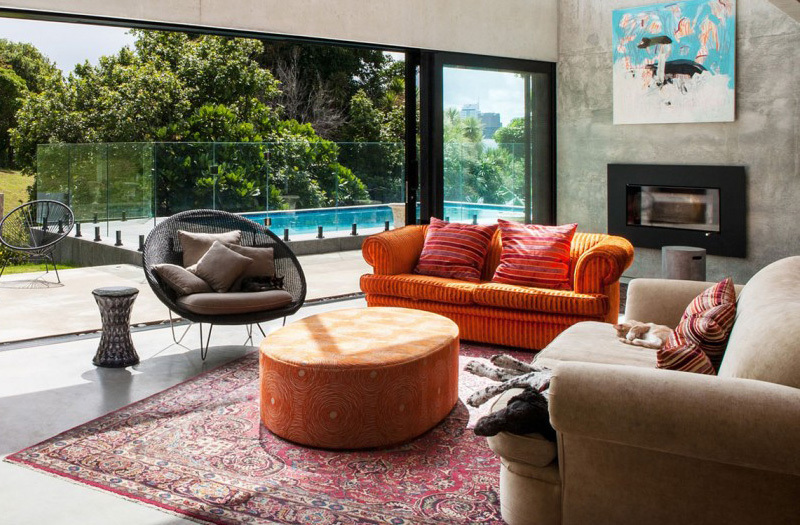 According to the designer this newly built house is situated in the heritage of Freeman’s Bay which is made up of concrete, steel and glass that gives a handshake to the past. 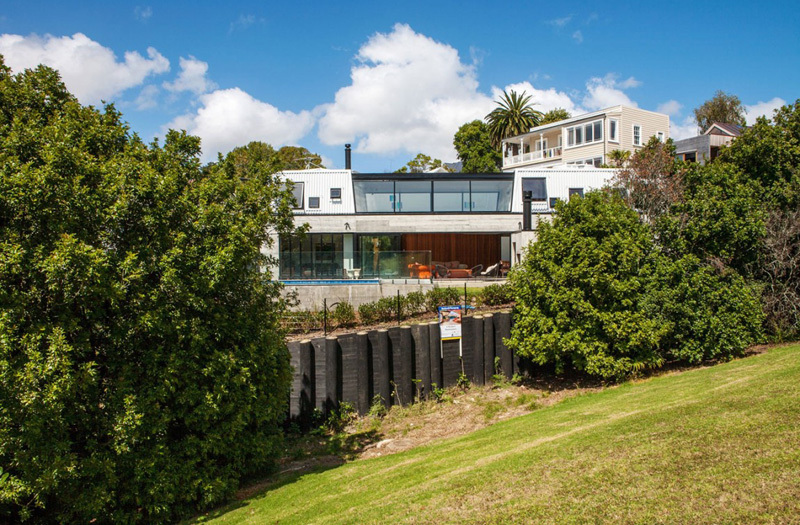 We can even observe the horizontal texture on the precast concrete walls that echoes the linearity of weatherboards. The roof is styled as a Dutch gable and clad in steel, which is also conceived as a habitable “attic” space that makes the reference to the dormers of colonial times. Unique feature: This house project exposed the amazing combination of natural elements and modern furniture and fixtures that accommodates the contemporary look of the interior and exteriors. 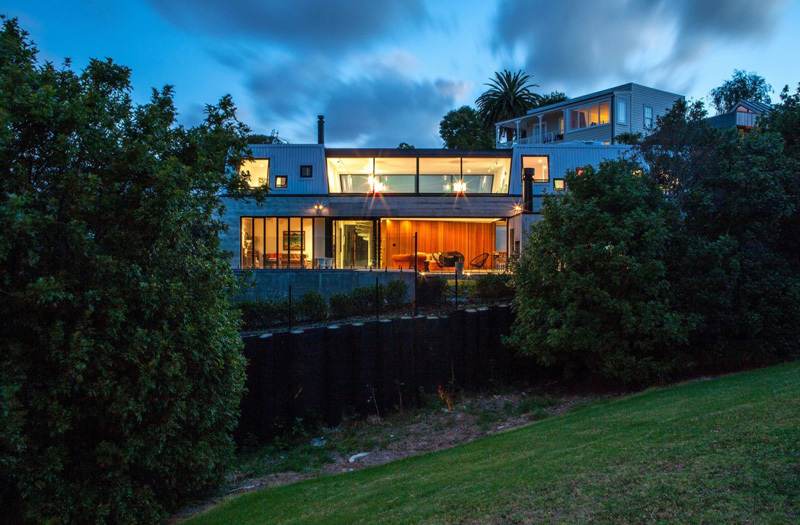 The geometrical shape of the house building adds the classiness and stylishness of the Elizabeth Street House. At the heart of the green surroundings is a modern house designed and built for a family who choose to have a contemporary life. See the trendy form of the building that remarkably jives with the shape of the pool. 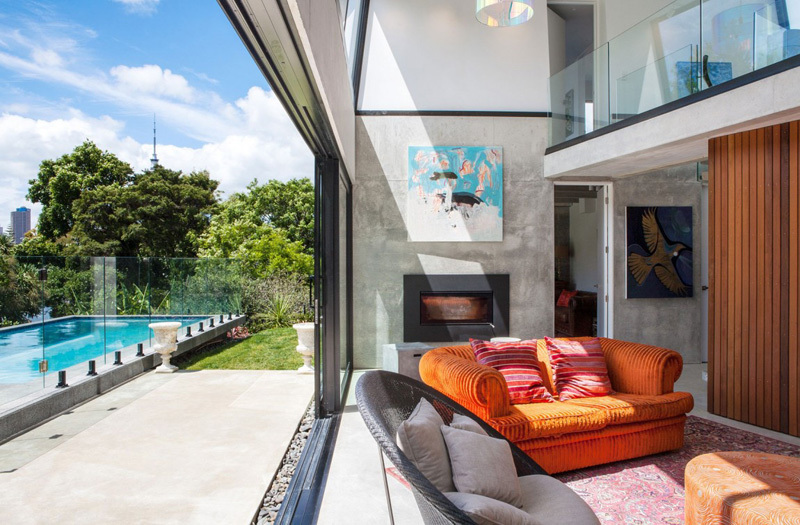 Looking closely at the exterior, we can see how the designer successfully provides an easy access for the client from the living space to the swimming pool area. Glassed frame in the swimming pool space is very effective to allow the client to still see the interior. The client may take the full advantage of the sustainable light even in the living space for the open layout concept applied in the interior. Fascinating shapes and colors of the furniture and accessories harmonized with each other. Warm colors of the carpet and comfortable seats blended well with the grey stoned walls here. From the interior, the client may still capture the beauty of the fresh water in the pool. Simple artwork in the wall underlines the nature inspired concept of the house that made this stand out among the other houses in the neighborhood. Stainless equipment showcased the elegant and charming materials uncover the modern features and its fashionable design, too. Ceramic tiled dining table complements with the design and style of the seats as well as the walls in the kitchen. Here is one of the favorite zones of the client for they can comfortably sit down and enjoy the stress-free space. Look at the traditional and antique furniture that adds the contemporary look of the living spaces. Shapes and colors blended well with each other in this natural stoned wall. This area shows the amazing ideas of the designer that will ensure the comfort and relaxing space for the client. Here’s the unique spiral staircase set in the middle of the interior that serves as best spot in the house. This also maximize the limited space here. The client also demanded for the office space where he can store his favorite books and other valuable stuff together with these artistic paintings in the wall. 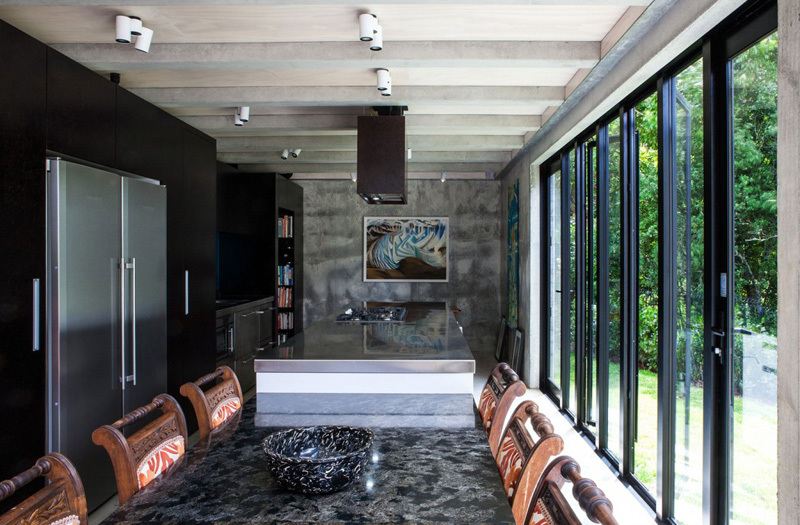 The natural design of the concrete walls enhance the look of the space. 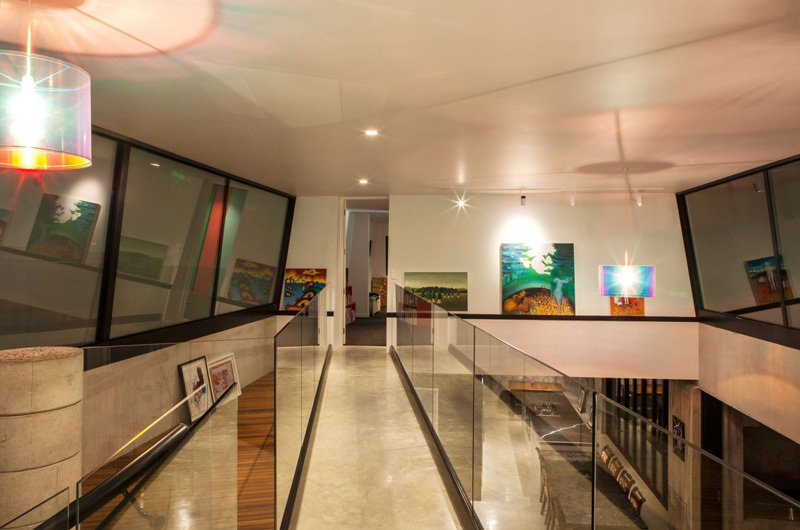 At the second level of the house, we can still see how the designer amazingly designed the area with beautiful paintings and enchanted lighting system. When sun sets the lighting system installed in the interior is very effective to come up with a romantic and fabulous mood in the living space. The edge and geometric forms revealed here also marks the finest concept in the interior design. See the enclosure set in this area where the designer incredibly applied the red and blue palette that made this area more comfortable and modern. Here’s the shower area where the glass material is utilized as the frame for it maintains its transparency and made this spacious despite of its limited space. Even in the bathroom, the client can still see the panoramic views for the designer secure a huge window in the bath tub area. 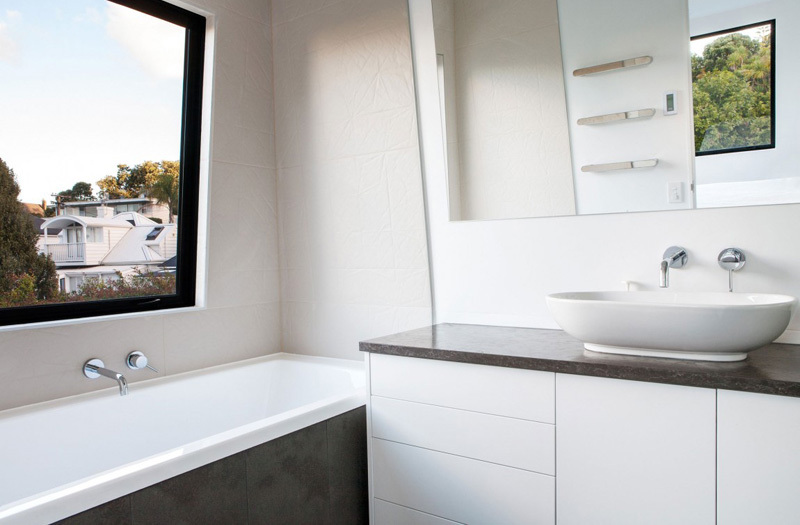 Observe how the modern fixtures in the bathroom shows its trendy concept and design. At night, the sophisticated lights unveil the tranquility and serenity mood in the exterior and interiors of the house. The geometric figures of the house stand out in the middle of the night, too. 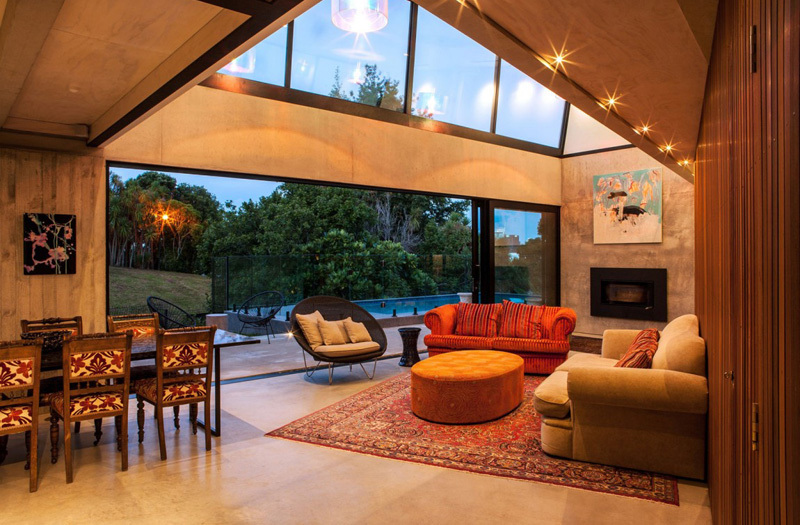 As we have seen the different angles and zones of this house, we can say that the Dorrington Atcheson Architects presented surprising architectural geometry of the home which is picked up in a spiral stair of concrete that leads to the upper level. I personally like the diagonal bridge which serves as link between the adults and kids’ bedrooms. As a whole this family home suits the owners’ brief for an interpretation of contemporary living that celebrates the raw expression of raw materials with an unexpected combination of openness and enclosure. We hope that we have presented another set of great ideas and inspirations that will enhance the look of your house or may be your guide in building your own house in the future.